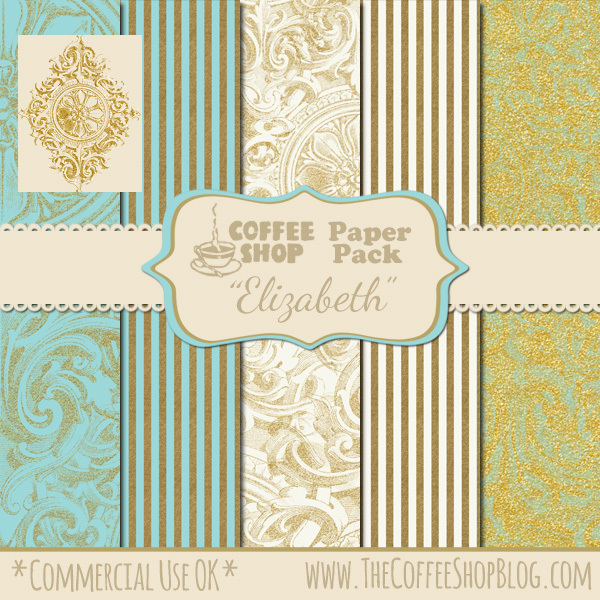 The CoffeeShop Blog: CoffeeShop "Elizabeth" Digital Paper Pack! CoffeeShop "Elizabeth" Digital Paper Pack! I just realized that I haven't posted any digital paper packs in a while, so I had fun creating a new pack today. I used a really pretty victorian ornament I found over at Graphics Fairy and designed some paper with gold trim. I even included a little gold ornament with a transparent background that you can use on your own designs. You can use these papers on your blogs/websites, headers, Facebook covers, cards, storyboards, etc. Have fun playing with them and post your designs over on my Facebook page so I can admire them! Download the CoffeeShop "Elizabeth" Paper Pack. You can also download it here. Rita, you are so good! I love this! Beautiful! Thanks also for telling us about The Graphics Fairy! Wow, these are gorgeous. Thanks so much!